This section provides an overview of what vba is, and why a developer might want to use it. It should also mention any large subjects within vba, and link out to the related topics. Since the Documentation for vba is new, you may need to create initial versions of those related topics. You can open the VB editor in any of the Microsoft Office applications by pressing Alt+F11 or going to the Developer tab and clicking on the "Visual Basic" button. If you don't see the Developer tab in the Ribbon, check if this is enabled. By default the Developer tab is disabled. 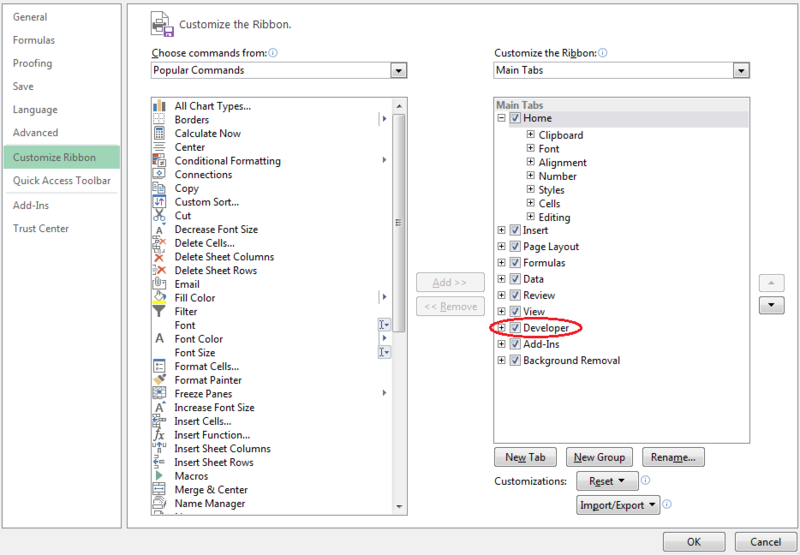 To enable the Developer tab go to File -> Options, select Customize Ribbon in the list on the left. In the right "Customize the Ribbon" treeview find the Developer tree item and set the check for the Developer checkbox to checked. Click Ok to close the Options dialog. 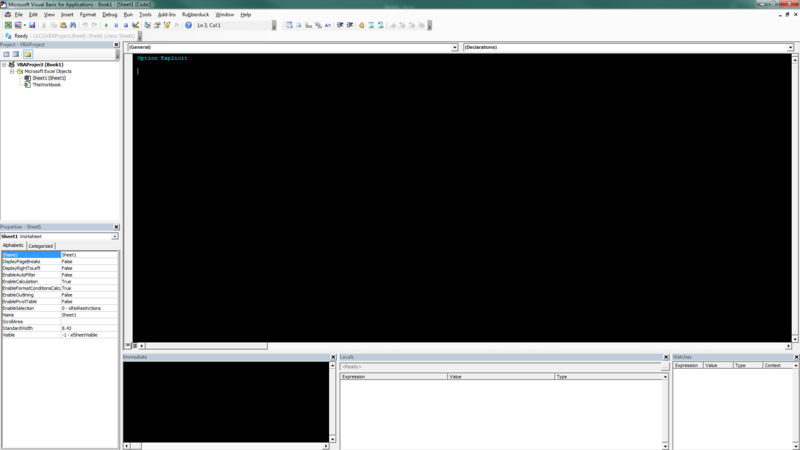 The Developer tab is now visible in the Ribbon on which you can click on "Visual Basic" to open the Visual Basic Editor. Alternatively you can click on "View Code" to directly view the code pane of the currently active element, e.g. WorkSheet, Chart, Shape. You can use VBA to automate almost any action that can be performed interactively (manually) and also provide functionality that is not available in Microsoft Office. VBA can create a document, add text to it, format it, edit it, and save it, all without human intervention. Debugging is a very powerful way to have a closer look and fix incorrectly working (or non working) code. First thing you need to do during debugging is to stop the code at specific locations and then run it line by line to see whether that happens what's expected. Breakpoint (F9, Debug - Toggle breakpoint): You can add a breakpoint to any executed line (e.g. not to declarations), when execution reaches that point it stops, and gives control to user. Step into (F8, Debug - Step into): executes only one line of code, if that's a call of a user defined sub / function, then that's executed line by line. Step over (Shift+F8, Debug - Step over): executes one line of code, doesn't enter user defined subs / functions. Step out (Ctrl+Shift+F8, Debug - Step out): Exit current sub / function (run code until its end). Run to cursor (Ctrl+F8, Debug - Run to cursor): run code until reaching the line with the cursor. Right-click on it then select "Add watch". Right-click in watch window, select "Add watch". Go to Debug - Add watch. When you add a new expression you can choose whether you just want to see it's value, or also break code execution when it's true or when its value changes. The immediate window allows you to execute arbitrary code or print items by preceeding them with either the Print keyword or a single question mark "? " Whenever your code doesn't work as expected first thing you should do is to read it again carefully, looking for mistakes. If that doesn't help, then start debugging it; for short procedures it can be efficient to just execute it line by line, for longer ones you probably need to set breakpoints or breaks on watched expressions, the goal here is to find the line not working as expected. Once you have the line which gives the incorrect result, but the reason is not yet clear, try to simplify expressions, or replace variables with constants, that can help understanding whether variables' value are wrong. To test it, hit the Play-Button in your Toolbar or simply hit the F5 key. Congratulations! You've built your first own VBA Module.